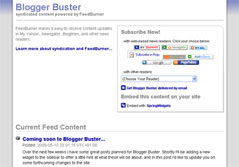 Feedburner is the most popular and fully featured free service for syndication of your blog feeds. Once you have set up your free Feedburner account, you can choose to redirect your blog feeds through Feedburner, instead of simply offering the default Atom feeds which are automatically generated for your blog. There are many reasons why redirecting your Blogger feeds through Feedburner will be beneficial for both you and your readers, but while researching for a forthcoming post, I've come to realize how few Blogger users actually do this. So in this post, I'll offer four important reasons why you should redirect your feeds through your Feedburner account, and also explain how easy it is to do. This also means that all of your subscribers will receive a feed with the same (possibly improved) formatting. While many bloggers choose to add a Feedburner account and offer this syndication to subscribers, those who don't redirect their feeds through Feedburner will seem to have fewer subscribers! It is virtually impossible to know how many subscribers retrieve your default blog feeds unless you redirect them through Feedburner (or another service which is able to catalog feed retrievals). 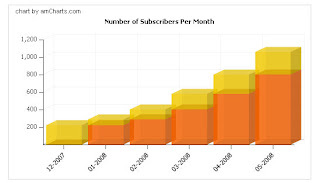 Most Bloggers who choose to redirect their feeds through Feedburner notice a sharp increase in their subscriber count. Also, you will be able to monitor your subscriber count, since you will have access to daily, weekly and monthly feed analysis. As your blog matures and your posts reach a wider audience, you will undoubtedly notice an increase in your subscriber count. Using your blog's subscriber count is one method of analyzing your blog's growth, and can also offer statistics of page views and popular posts. The page on the left is an unformatted, default feed page which is accessed when feeds are not redirected through Feedburner. The page on the right is a feed page generated by Feedburner. As you can see, this is much more visually enticing, and includes easy subscription options for your readers to use their favorite feed readers to subscribe. Go to Settings>Site Feed in your Blogger dashboard. I hope this post has helped you realize the benefits of redirecting your Blogger feeds through Feedburner. Please feel free to leave your comments (or indeed, your own incentives!) below.